Another Pennsylvania court recently ruled that information posted by a party on their personal Facebook page is discoverable and ordered the plaintiff to provide their user name and password to enable the production of the information. Largent v. Reed, Case No. 2009-1823 (C.P. 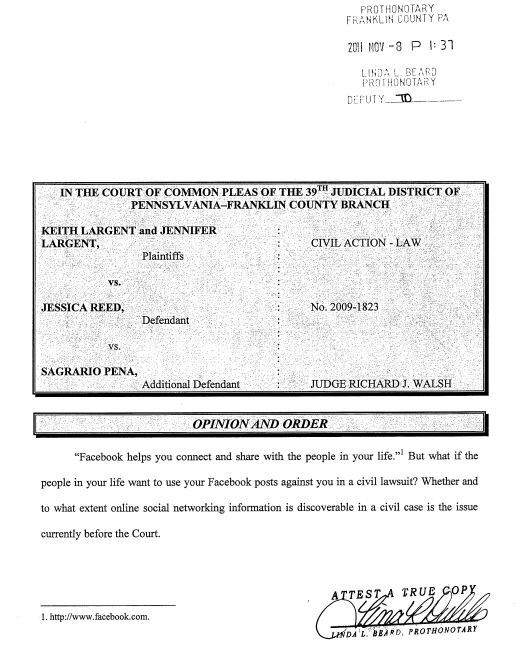 Franklin Nov. 8, 2011) features a detailed and instructive 14 page opinion from Court of Common Pleas Judge Richard J. Walsh that is a must read for anyone remotely interested in the topic of electronic discovery of social media. It is one of those well-written legal opinions that I liked to use as a framework for my motions on a given subject back in my litigation days. The case arose out of a chain-reaction automobile vs. motorcycle accident from which the plaintiffs allegedly suffered serious and permanent physical and mental injuries. However, the Facebook public timeline page of one of the plaintiffs featured content that contradicted her claims of serious injury, including several photographs showing her enjoying life with her family and a status update about going to the gym. Based upon this information, Defendant moved to compel disclosure of Plaintiff’s Facebook username and password. 3. Stored Communications Act. The Court found that Plaintiff’s information was not protected by the Stored Communications Act, which prevents the government from compelling Internet Service Providers (ISP) from disclosing information about their users. However, in this case the information was sought directly from Plaintiff, who is not an ISP. Again, I recommend that you read this opinion in its entirety. We will continue to report on any significant cases in the social media legal realm.